Discover Atlanta Marriott Suites Midtown and walk in the midst of art and culture while staying in a chic hotel in midtown Atlanta. 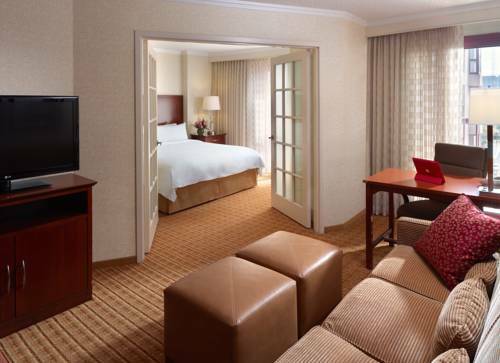 Boasting more than 250 Atlanta hotel suites, our Midtown accommodations provide guests with plush amenities like oversized bathrooms and sleeper sofas for a relaxing retreat. Out of all the Midtown Atlanta hotels, ours is the closest to Crescent Avenue nightlife and is an easy walk to Piedmont Park. Explore the art scene at the High Museum of Art or catch a show at the Tony-Award winning Alliance Theatre, both conveniently located within walking distance from our hotel suites in Atlanta, Georgia. Interested in venturing outside of Midtown? Hop on the nearby MARTA, Atlantas public rail system, and take advantage of easy access to Buckhead shopping, downtown museums and much more. If youre interested in a vacation, staycation or business trip, our Midtown Atlanta hotel is ready to accommodate your travel needs. Full breakfast buffet and standard American fare for lunch and dinner.